Hope you all had a restful holiday season. A couple weeks off means some catch up on news and opportunities. A couple of great opportunities coming up in January – in addition to our upcoming webinars, the USDA is hosting an 11-part webinar series calling "Planning for Farm to School Success." These 30 minute webinars are kicking off next week with the first – on planning and building Farm to School teams (one of my favorite topics!). There are also two great Michigan conferences coming up that may help you connect with local farmers. I also wanted to share an exciting article on a Hoophouse for Health partnership in Menominee, as well as some news on our friends over at Sprout in Battle Creek showing the power of partnering Farm to School programs and food hubs. 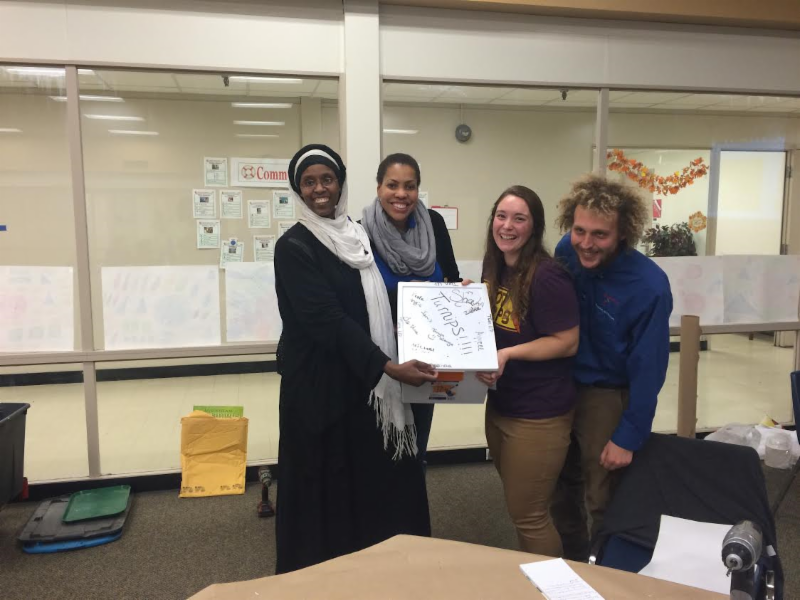 2016 seems like its set up to be another great year for farm to school! This webinar will highlight examples, strategies, and lessons learned in using institutional purchasing power to shift practices towards healthier food. Register here. Learn tips and best practices for creating a farm to school team, facing struggles and surprises, and building a foundation for a successful project. Register here. Highlights Sprout's work to use their food hub aggregation power to get two schools local food and small farmers access to institutional markets. Part 1 of a series focusing on initiatives within the HHFKA that aim to shift school food environments – focusing on the National School Lunch Program nutrition standards. Did any of you make New Years resolutions? Mine is to use less exclamation points in my emails. I think I've failed already! Talking Tomatoes, Rainbow Wraps, & More! 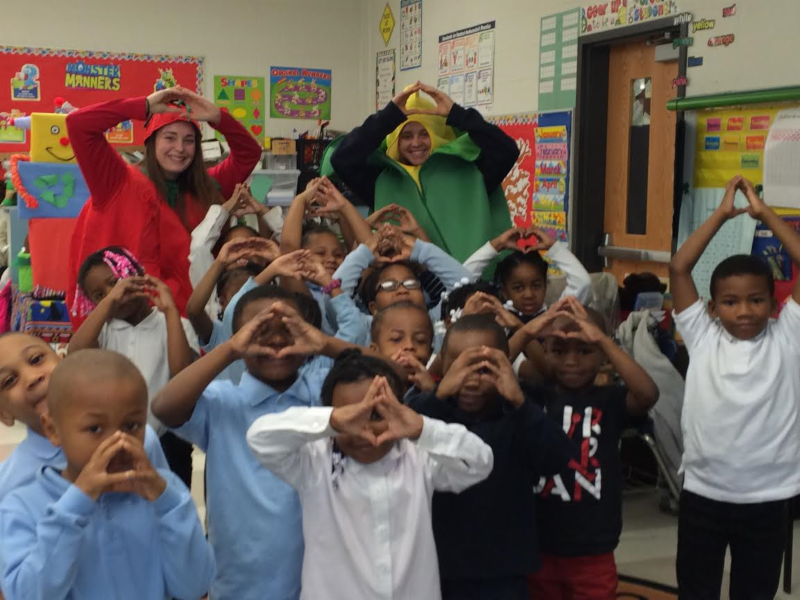 Students at Mackenzie Elementary learning the importance of healthy eating and plant parts from Tammy Tomato and Carlos Corn! 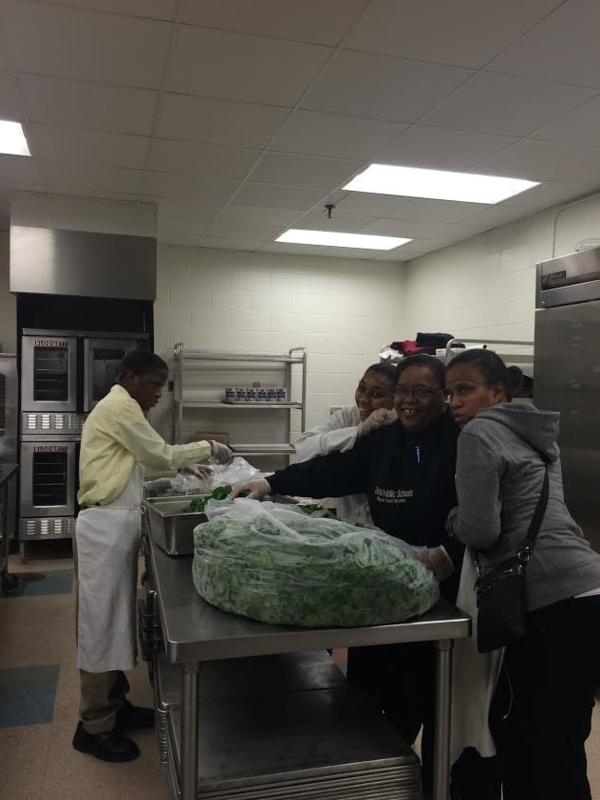 OSN Staff Lead, Katina Laird, works with students on prepping freshly harvested and washed greens at Drew Transition Center. Nice work Ms. Laird and students! Drew Farms staff is excited to announce over 2,700 pounds of mixed salad greens were harvested between October-December and distributed to 11 Detroit schools. The mixed greens are prepared in salad cups with tomatoes or as loose lettuce on the tray. A new small scale washing station installed at Douglass Academy for Young Men now allows DSGC run a full-fledged farm to school operation. Fresh produce is grown at Drew Farms, washed and prepped at Douglass, and then distributed to schools across the city. Office of School Nutrition Head Chef, Kevin Frank ,and his food service team have done an excellent job leading the washing procedures at Douglass. Additionally, food service staff across the district have been preparing the fresh produce being dropped off to schools and serving it to students. 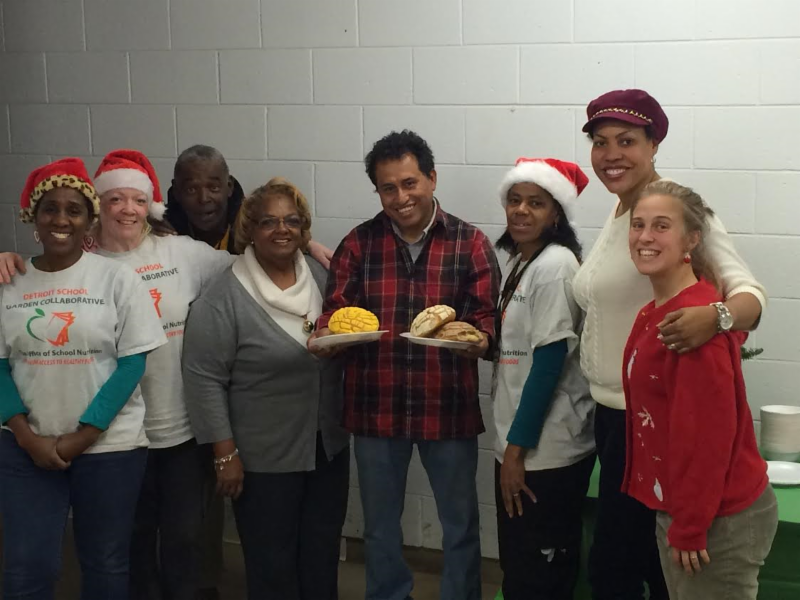 Thank you to all OSN Food Service staff! Garden Attendants Colleen Walker, 'Mr. O.' 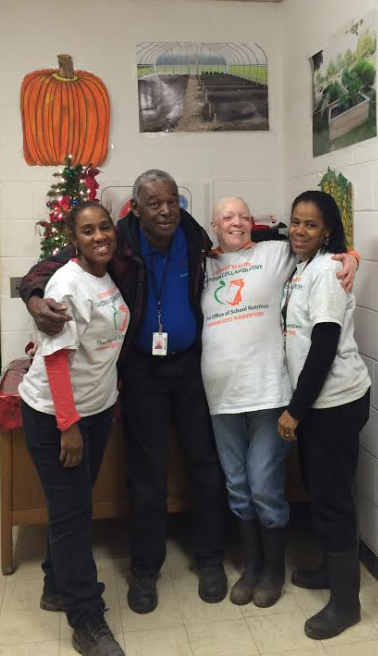 Elvin Owensby, Roxanne Brown, and Sarita Walker. You may have seen them at your school gardens, but these 4 outstanding Garden Attendants have shifted gears this season to assist in the Drew Farms high tunnel food production. Despite being a mild winter, these individuals have braved some chilly early mornings to keep the Drew Farms high tunnels up and running to produce high quality fresh produce for Detroit schools. From preparing the soil to seeding, harvesting by hand, and packaging, these four individuals (led by High Tunnel Manger, Michelle Lutz, and Farm Manager, Matt Hargis) are a true inspiration for what it means to serve our city's children with healthy food. Dr. Rhodes-O'Neil, West Side Academy teacher, DSGC Director, Zaundra Wimberley, FoodCorps member Brooke Juday, and Drew Farms Manager Matt Hargis pose with Dr. Rhodes-O'Neil and her winning worm bin. 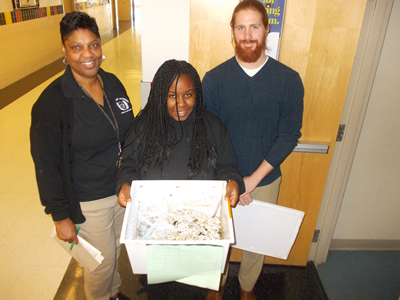 West Side Academy teachers Ms. Butler and Mr. Gauthier with student Casandra Brown, after recording vermicomposting observations. Nice work! Last month's professional development, a partnership with the DPS Office of Science and Michigan State University Extension, was led by school garden educator, Kristine Hahn, who introduced the how-to's of composting and vermicomposting, the benefits it offers school gardens, and how it can be integrated as a learning tool in classroom curriculum. 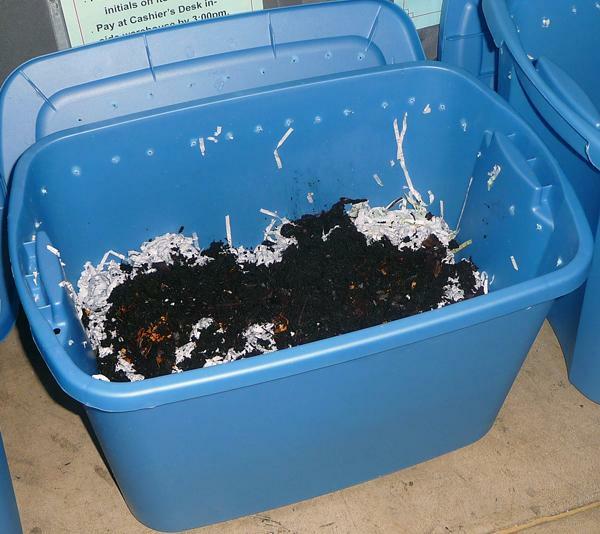 Want more vermicomposting tips?Check out MSU's Extension Vermicomposting Guide. 1.) Drill about 20 holes near the top of the bin and on the lid to allow for ventilation. 2.) Layer the bottom of the bin with shredded newspaper, dampen paper with spray bottle of water. 3.) Toss in handful or two of soil. 4.) Add loose leaves, compostable food scraps, and another layer of shredded newspaper. 5.) Add red worms to the bin. 6.) Add another layer of newspaper and dampen with spray bottle. 7.) Place sheet of cardboard on top of the newspaper. 8.) Feed worms slowly (a couple times a week) and gradually increase as worms begin multiplying. Bury the food scraps in different spots to encourage worm movement. Once your bin has transformed into "black gold," spread throughout you garden beds! Worms can be used again to continue vermicomposting or go strait into your garden. 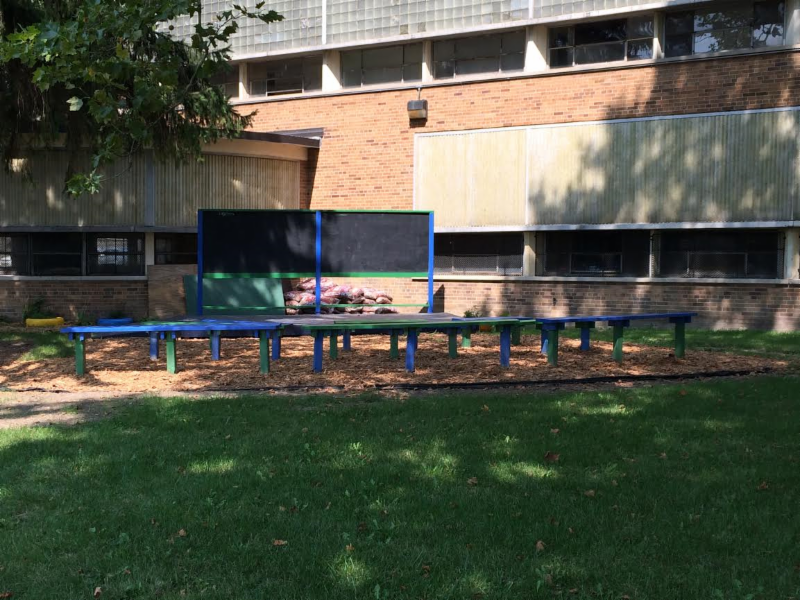 Want to integrate your school garden into your curriculum but not sure how? Looking for tips on how to strengthen preexisting lessons? Then this training is for you! Kristine Hahn from Michigan State University Extension will be leading the workshop. A light meal will be provided, courtesy of the DPS Office of School Nutrition. *All DSGC Teacher Trainings are approved Detroit Public School Professional Development and are a collaboration with the DPS Office of Science. Please sign up via www.solutionware.com/dps. *Non DPS faculty, staff, and community members, please emailgarden.program@detroitk12.org to register. Thank you, we hope to see you there! 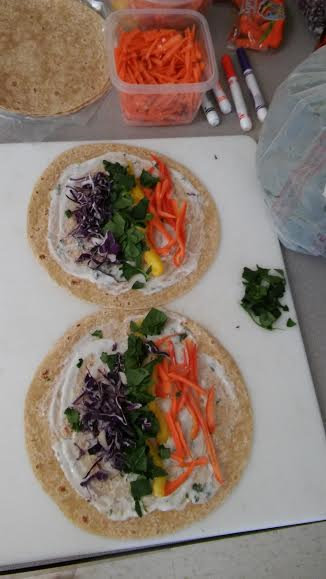 Students enjoying a fresh "rainbow wrap" made in class after learning about the importance of eating a variety of fruits and vegetables. Outdoor classroom space at Cody High School with benches, blackboard, and bark chip surface, all made possible through external grant funding awards. Wash and rinse all produce. Slice red and yellow peppers into long strips. Thinly slice carrot into long strips. Optional: spread hummus or dressing onto tortillas. Place peppers, cabbage, and carrots into rows on tortilla like a rainbow. Roll up tortillas and enjoy! Note: You can add sliced meat to your wraps. We recommend turkey breast, low in sodium and high in protein! These wraps are loaded with nutrients! The peppers in particular are a great source of Vitamin C and the leafy greens are an excellent source of Vitamin K, an important nutrient helping bones grow healthy and strong! 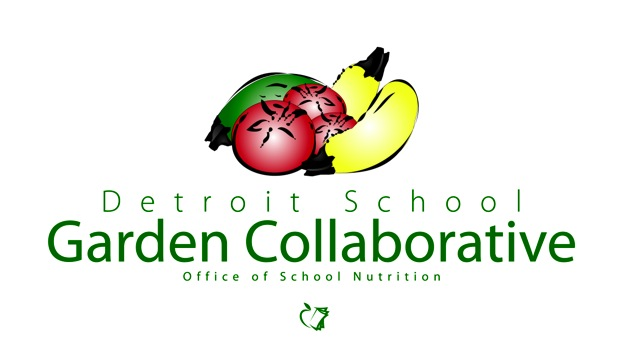 Join Friends of the Detroit School Garden Collaborative! Happy Holidays from DSGC Staff! The DSGC Staff wishes all of our teachers, principals, students, community partners, and volunteers a very blessed holiday. Thank you for being a part of our program and our mission to provide fresh, local, and nutritious food to Detroit students and their school communities. Want to learn more about DSGC?